In New Orleans, I rediscovered my love for my Soludos when I realized that espadrilles are seriously the most comfortable shoes, even if you plan to walk 20,000 steps a day in them! I wore my Soludos almost everyday in Europe last summer too, and that says a lot given how much the average tourist walks on a European vacation! 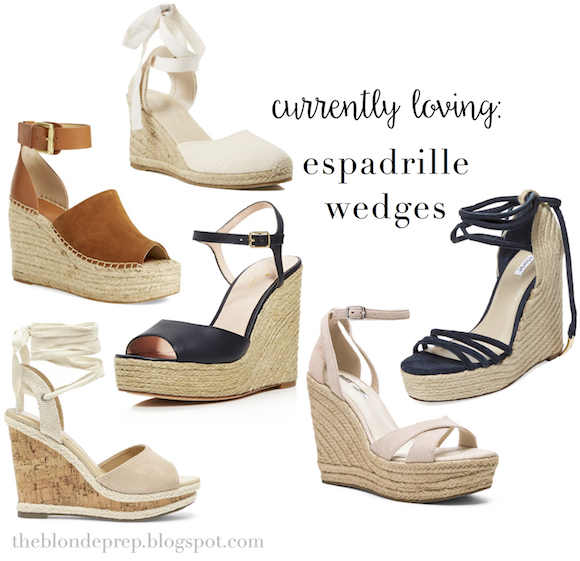 For summer, I absolutely love wearing wedges with skirts and dresses, white jeans, and the occasional cute pair of shorts, and I am lusting over all of the espadrille wedge options! As I mentioned, espadrilles are amazingly comfortable, so I'm sure in a wedge pair you wouldn't feel any of that horrible "I hate wearing heels" pain at all! This pair is under $70 and I personally think it's one of the cutest in this bunch. Also, most pairs come in multiple colors including navy (#navyornothing!) and a solid neutral option... winners! What are your thoughts on espadrille wedges? Do you have a pair? I love espadrille wedges! I always try them on and never buy any, but you picked out some awesome pairs! I'll have to check them out! I love the pair with the ribbon on the back, so cute!